Now, were you doing the labor, or were the pics of the construction crew? That is so helpful. I have so many questions. I guess I will wait for the plans then start asking. Yours turned out beautiful!! ClimbHi-- I am especially interested in images DSCN 2121, 2118, 2117. I want to transfer that barrel shape to the outside of my oven, as in the photo below. Is there vermiculite under that cover or are you about to apply it. What material is that barrel/dome made of? I am looking for something that will maintain the shape while I cover it in brick. Thanks. The oven dome is made up of three layers. First is fire brick. (I've read you can use regular brick, but it doesn't hold up as well and is more sensitive to thermal shock.) Next is a layer of regular, heavy duty aluminum foil. This serves as a break between the brick and the next layer so the differing coefficients of expansion do not crack the structure -- kind of an expansion joint. The top layer is a layer of concrete reinforced with steel mesh. The thickness of the concrete is determined by how much thermal mass you want. The more mass, the longer it takes to heat, but the longer it holds its heat. Mine is about 3 or 4" thick at the top, thicker at the sides. I love the stonework. did you build or have it built? I agree this is a nice oven. It belongs to someone called Dave. It is how I want my oven to look though. Wish I knew who Dave was and where he's from. Beautiful oven, ClimbHi, and practical location sheltered off of your kitchen! What kind of considerations had to be taken with your local firecode to build inside or adjacent to a house, or is that addressed in the Scott plans? I'd like to build something someday in a sheltered patio area near an above-grade poured concrete basement wall (walk-out basement). CCM, that looks like a happy guy in your post's pic, who wouldn't be working with a beautiful oven like that! Firecode: It's treated like a fireplace, basically. That means a 2" clearance between the oven structure and any combustable elements. In my case, I "boxed" the oven in with steel framing covered with cement board. That outer box is 2" from the house wall. In addition, there's about 6" of vermiculite insulation between the oven and the outer box. Also, the flue is tripple-wall stainless, rising 2' above any part of the adjacent structure that's within 10'. By far the most expensive part of the project since I needed a lot of chimney due to the location of the oven. Very good job. A labour of love, obviously. You will find it very rewarding. Impressive Job on the Oven! I just browsed through your photo essay of your building project. I'm impressed at how well you thought it through and how nice it looks. The fact you were able to build next to the house makes it all the more functional, year around. The year-round use feature is the best. Yesterday, My Lovely Assistant pulled some pulled pork out of the freezer for dinner. I made up a baguette, two epi, (our bread supply for this week) and some buns for the pork, despite the fact that it was snowing. Nothin' like a pulled pork sammich on a fresh sourdough roll, some sweetater oven fries, and creme brule for desert! I got my plans from oven builders today. What size hearth did you use? I am having some concrete bids next week. Our 4" slab is not going to work. So we will have to cut it and have a 6" slab with footers poured. I guess we have bad soil ( I knew this from gardening but didn't know it affected pouring concrete.) I am thinking about going with the 32x38 in one. I think that will be big enough. Mine is a hybrid, due to space limitations. Mine is wider than it is deep -- the reverse of most ovens. The closest plan to what I ended up with is the small Scott oven. I think the 32"X38" will be fine for home use. As for the concrete, this is an oven, not a house. Don't let the concrete guys needlessly inflate the budget. You actually don't even need a slab under the oven -- just sufficient support along the perimeters for the walls, i.e., a proper footer. Make sure they understand what's being built and can justify their recommendations. "Bad soil" for concrete is different than "bad soil" for gardening. Concrete wants a stable, well-drained base. If the soil is wet or unstable, they may have to go a bit deeper to reach something that will not move. Also, I forget where you are located, but freeze-thaw may be an important consideration for you as well. So freeze thaw is not the problem. Hurrinces maybe. But we know a guy who does pools as well as stone and things. I think he is going to let me have the left over concrete from a pool. Which will save me a lot. It is the cutting of the 4" slab that I just don't want to do. Did you put rebar up into the cinder blocks on the base? I Know the Pizza Guy from above did. I was just wondering. The Scott plans don't say it is necessary. I also founf a construction company down the road with stacks of extra bricks just sitting outside. I am wondering if they will let me have them. They have been there a while. What did you use to cut the bricks on the transition from the dome to the oven opening? We have a tile saw and a diamond blade. Will that work? I have more questions but I guess I will save those for when they come up. Oh, Did you cook the pork the other weekend in the oven as well as the bread? That is what I am looking forward to. Cooking all at once for the week! Oh and pizza parties! No, I didn't bother with rebar in the blocks. (That's not done all that often even when building houses! Only where there are special load or seismic considerations.) Regarding the foundation, here's my thought: If you can park a car on it, you can put an oven on it, since the oven will weigh less. Are they putting footers under 6" thick concrete driveways in your neighborhood? (I'd be surprised.) I still say if your pad is in good shape and has been stable, it'll probably stay that way with an oven on it. That's gonna have to be between you and your concrete guy though. If you trust him, go with what he says. As for brick, I used fire brick for the oven, and recycled brick for the outer box. Some say regular brick is fine for inside the oven, but I wanted the peace of mind of fire brick. (This was fun to build, but I sure didn't wanna do it twice in one spot! LOL) This is of particular concern for bread baking, since the steam used can cause some pretty serious thermal shock that common brick may not be able to withstand very well. Recycled brick, or even found stone, would be fine (even preferable) for the exterior. I just used a small angle grinder with a cheap continuous rim diamond blade, dry, to make all the masonry cuts. You can see it in a couple of the pics. (But don't do this when the nice neighbor lady is hanging out laundry. DAMHIKT!) You can pick one up for around $100 if you don't have one. The blades are only about $10-15 IIRC. A tile saw would work fine for most of the cuts if you have one with the capacity. Mine wouldn't handle a brick thickness (2"+) under the motor. I also cut some bricks lengthwise, on the diagonal, to start the arches. These cuts would have been impossible on a tile saw, but aren't really necessary either. We actually had a couple pounds of pork in the freezer left over from the last time we made it, so all we had to do was microwave it and add the Jack Daniel's sauce. Oh, and then not eat for the next three days to lose the weight I gained from pigging out! Yes I was only going to use them for the exterior. I am so not taking the chance that the interior of the oven cracks. So I will go ahead and just buy firebricks. I don't think they are that expenive anyway. I will have to ask Kyle is we have if we have an angle grinder. We have all kinds of tools out there that i don't even know about. It would not suprise me if we have one. I have talked to 3 different concrete guys and they are all telling me I need at least 6" of concrete. I am wondering why they are saying that. I guess they want the work and keep thinking of the weight of the concrete. I still have one more guy to talk to. But the lady with Oven Crafters said the 4" wasn't good enough. What else have you cooked in yours? I am thinking of all the things I can cook in succession so as not to waste all that heat. Oh and where so you get the wood? We have a fallen oak out back I can cut and lots of other fallen trees around from IKE. But I was wondering if you had found a good wood supply. I think I'd listen carefully to your concrete guys. The Houston area soils are typically expansive clays. In other words, when the soil gets wet, it expands; when it dries out, it shrinks. Concrete, while very strong, isn't flexible enough to handle the ups and downs of the soil swelling and shrinking underneath it. Hence, the recommendation for a thicker slab and footers. The footers, in particular, get you deeper into the soil where moisture content is less variable. I'd also put some form of reinforcement in it, even if it's just wire mesh. The other thing to strive for is keeping soil moisture content relatively stable (this is good for the slab under your house, too). I had an irrigation system installed at my home when we lived there, as much for the good of the foundation as for the good of the grass and flowers. This is what I am thinking too. Esp with the rain we get around here. It will be reinforced for sure. FWIW, the footer you use will be far more important than the slab as far as movement/support goes. Especially if you are dealing with expansive clays, as another poster suspects. We pretty much cook anything we can cook in our "regular" oven except things that take fairly precise temp control. Flan comes to mind. Still, with experience, I don't see why you couldn't cook anything. Wood. So far, I've mostly been using wood I split from neighborhood trees. I do find that the wood works best if it's coked -- I load the next batch into the oven to dry at the end of the bake and leave it there for several days. I also use a lot of hardwood scraps from my shop. I just had to buy my first load of wood -- got a load of cherry that I'll re-split (normal firewood is too big IMHO) and dry a bit more before using. There is a local outfit that kiln dries wood for local restaurants. You could ask places with WF ovens where they get theirs. It's expensive tho' -- over 3X as much as regular firewood. Not worth it for home use where you can coke. Probably necessary for commercial use where this is not possible. Oh, and did you use thermocouples? Or do you use a laser thermometer? I rarely need it anymore tho'. Once you've fired a couple of times, you learn to guage pretty well just by time, and looking at the fire and the brick. Nope. Lord knows I've learned enough from all the other posters on this forum. Happy to be able to contribute in an area I actually know something about! We do HVAC and he has one for that. We also have an infared camera and I can't wait to see what the oven looks like fired after it is built that way. My oven would be pretty unimpressive, color-wise, on a cam. It's better insulated than the house! The snow on its roof doesn't even melt during a firing. I'm so very jealous - that looks so awesome! Here is what I use to bake breads outdoors. This device can cook over a heat range of +/- 100 degrees F. to over 1000 degrees F. Check forums for the types of things that can be cooked. The prices are listed as well. Like you, CH, I built an AS design barrel vault, very high mass, 4' x 3' hearth. Only lately have I gotten an IR gun, which I use mainly for demonstration purposes while teaching. During the build, I installed four thermocouples: hearth, slab, dome, cladding. Over time, I've found them to be the most useful, especially because the temps of the mass and inside the brick, not surface temps, tell me how many consecutive bakes I can get and just how fast the hearth and dome temps will drop over time. I don't use an air temp gauge at all, because I've found it can be misleading, unless I'm cooking a chicken. Just some thoughts for future builders. As far as insulation goes, like you I did fill the enclosure with loose vermiculite, but that was eight years ago. 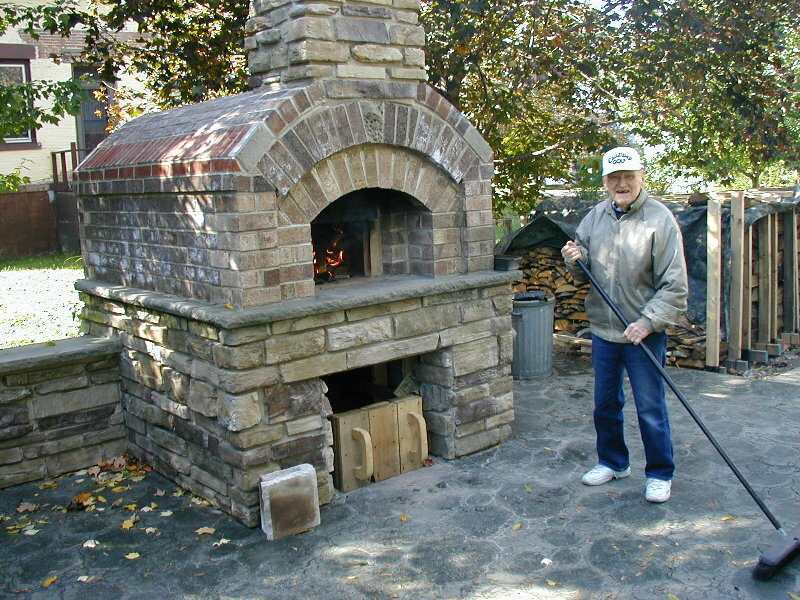 I've installed/built many ovens since then--and learned a lot. Under the Resurrection thread, you'll find that these days I use a combination of ceramic high heat batting and a castable insulator called Matrilite 18. Together these are far, far better insulators, inch for inch, than vermiculite/perlite could ever hope to be. It's more work, sure, and it's more expensive, sure, but how many times will this be done on any one oven? Although I have the greatest respect for the late Alan Scott, using angle/lintel iron to bridge the gap over the oven mouth is not such a "hot" idea. These days, I span the gap with a custom cast lintel made from Kastite. It has the same expansion/contraction properties as firebrick. Iron does not, and can lead to cracking above it in the dome and in the facade. I followed AS's recommendation for a vermic/Portland layer below the slab. However, this is the thermal weak spot in these ovens, because the layer is not that great of an insulator. After firing the oven for several months (really, really dry), I added a two inch thick layer of high heat insulation board (K-Fac by name, but there are other trade names) under the vermic layer. This retrofit made a remarkable difference in heat retention, especially because I'm in Ontario and use the oven year round. Check out Chicago Fire Brick on the web for insulators and castables. As for the steel lintel, again, this did cause me to wonder when I was building the oven. I left a bit of room for lenghtwise expansion and hoped that expanision in thickness would be small enough not to cause problems. So far, so good. But . . . .
As for the thermocouples, I elected to skip them for cost savings and go with an IR gun instead. I really missed them at first and found myself wishing I had sprung for them. But as I gain experience with my oven's heat profile, I find I hardly ever even use the IR gun. I do find the air temp guage to be somewhat useful, but only as a guide to help estimate cooking times for such things as roasting veggies, fish (we had killer WFO salmon en croute this weekend) and meats like chicken. I agree that it has little direct use though, since most of the cooking in a masonry oven comes from radiation and not air convection. That said, I'm filing your post away for use if/when I build another WFO. Especially if it's to be used daily or commercially. Then, the insulation becomes a bigger factor, and durability (such as not cracking from thermal expansion!) becomes critical. Glad you found our little corner of the Web and hope you continue to share your WFO knowledge and experience with us here. i can only imagine what you know now about oven performance. i have a few questions about building. do you think the hearth slab,and cladding will get hotter than 750F if i am baking bread at 500f or so consistently every day? The reason i ask is because i am trying to figure out if i need to use refractory concrete for hearth slab and cladding. or if i can get by with portland. i live in british columbia nelson to be exact and i have a hard time finding alumina and i'ts also very expensive. does the cladding on the sides and above the dome need to be as thick? and if so could part of it be cladding and part brick? i am sorry if iam not beigh very clear but i am just learning the art of oven building. There is one trick when you have to use an angle iron lintel: add a thin (1/8") layer of high heat insulation between the bottom of the iron and the surface of the brick. This will allow some leeway, north-south. It's also good practice when using a stainless steel, double walled chimney system. Use the layer between the SS anchor plate and the oven mainifold (usually fire brick or cast refractory), and don't overtighten the tapcons used to attach it; just snug is good. Having said all that, however, a cast refractory lintel is still preferable. Alan Scott was a very good guy, but suggesting changes, improvements, modifications to his plans simply did not wash with him. I still find the thermos useful, especially for teaching purposes and especially for reading mass temps (6" above, 6" below) throughout the seasons. "Alan Scott was a very good guy, but suggesting changes, improvements, modifications to his plans simply did not wash with him." In that case, he probably would've hated that I plan to incorporate a smoke shelf into the design (a la Rumsford fireplace) if I ever build one again. Mine suffers from serious downdraft from the chimney which causes it to smoke out the front unless I close the damper all the way to restrict the chimney. A smoke shelf would eliminate this problem. I agree entirely. The sketchiest part of the AS plans is the transition between the vault and the chimney. You're pretty much on your own. Having been a professional "stone banger" in my past, I built what was essentially a traditional chimney throat, corbelling the brick inside it, course by course, until I had the right size for the flue tile I used (7" round). The draw is very good and no smoke out the door. One provisio for anybody building one of these ovens is not to face the oven mouth into the prevailing wind.